I originally trained in forestry with the forestry commission, then at Newton Rigg College in Cumbria. However, as my main interest lay in making things from a variety of different materials, I eventually "branched" out in other directions working mainly in mold manufacture and casting sculptural objects - ultimately leaving forestry behind for a good number of years. Circumstances dictated my return to forestry as an instructor with a university in Lincolnshire. Given the opportunity of a plentiful supply of timber of large dimensions and ready access to a variety of chainsaws, I started to further develop my carving skills. This eventually became a realistic proposition in terms of earning a living, so I gave up the "day job" and concentrated on the sculpture. It now supplies me with my main source of income. I first experimented with carving using a chainsaw in 1975. When the opportunity arose I would create totem poles and assorted furniture that could be used round the house and garden. For a number of years I participated in the major carving event "Sculptree" at Westonbirt Arboretum near Tetbury in Gloucestershire. Examples of that work appear in the gallery pages of this site. Like so many other artists I also take my inspiration from the shapes and forms nature has to offer, although in some ways I tend more towards the unconventional in that I find objects like animal skulls fascinating from a sculptural point of view. It was from this source that I decided on the subject for my first opportunity to carve as a guest at Sculptree '99. I chose to produce a giant roe deer skull which subsequently featured on the cover of Woodcarving Magazine. I also love to carve shells. Their apparent simplicity masks the rather complicated progression of a helix which, if one does not capture quite right, can result in the piece only being fit for firewood. My work is in demand for use or display by Local Authorities, Community Groups, Schools, Businesses,Theme Parks, Galleries, and individual clients. I have created a number of public works. Customers include Woodland Trust, National Trust, Sustrans, Assorted Developers, I can travel to carve logs and stumps on site if needs be. I have attended a large number of carving events including some abroad. 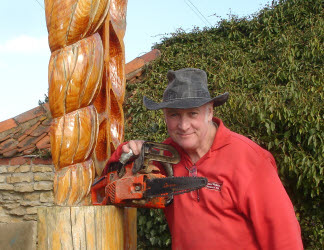 I am booked regularly as a key attraction at various events to demonstrate chainsaw carving. Also have demonstrated at numerous schools across the country. I have given seminars at the largest chainsaw carving gathering in the world Ridgway Chainsaw Carving Rendezvous. Participated over 7 years in 'Sculptree': an event that used to take place at Westonbirt Arboretum in Tetbury, Glos. This involved up to 12 carvers at a time, each engaged in creating a large wooden carving from a section of timber sourced from dead, dying, diseased trees that had to be culled from the arboretum. The carvings were auctioned off with half of the money raised going to a charity. I twice secured highest price at auction for my work. Have won at other smaller carving competitions Such as Woodfest Wales and the CLA Game Fair in past years. Have participated in the biggest chainsaw carving event in the UK for a number of years, The English Open Chainsaw Carving Competition. This event attracts carvers from all over the world, normally about 35 participants. I have won that once and been placed highly twice. I have given interviews on radio both in the USA and the UK. Have been interviewed several times on both national and local TV relating to my work and chainsaw carving in general (e.g. Grand Designs, Countryfile). Britain's Got Talent asked me to audition in 2008 also resulting in a very brief appearance (once again) on national TV. For a number of years, I ran the only chainsaw carving course in the UK.